The farming community of Lister is located in a picturesque valley hard on the U.S. border in southeastern British Columbia, Canada, in the shade of the Skimmerhorn Mountains. It lies roughly between Calgary and Spokane (the closest big town is Creston  pop. about 4,800). Founded by World War I veterans, Lister was always conspicuous for the dark secrets of many of its inhabitants. In the beginning, of course, these secrets were the simple memories of the horrors of war. But recent generations have struggled with more complex secrets centered on a farming settlement in a corner of Lister known as Bountiful  and paralleling the events that unfolded in Eldorado, Texas, in April 2008. On Jan. 7, British Columbia Attorney General Wally Oppal ended speculation that the government intended to co-exist with Bountiful by ordering the arrest of settlement spiritual leaders Blackmore, 52, and James Oler, 44, under charges of polygamy. According to press accounts, Blackmore is alleged to have as many as 26 wives and 108 children. (According to tradition, the first wife is listed as a legal marriage, and the others are "celestial wives" recognized only within their faith.) The upcoming trial will test polygamy laws in the face of the Canadian Charter of Rights and its broad protection of the exercise of religion. But more than anything else, the trial will test the mettle of a community that has wrestled with the thorny issue of Bountiful for more than 60 years. "It's not a simple issue," admits Andy Alfoldy, 67, a local artist and curator of the Alfoldy Gallery, who has lived in the area since 1974. To the outside world, Bountiful may seem to be a titillating sect, a real-life version of the HBO series Big Love. But to many locals, the Blackmores are simply folks with whom they've lived, worked and done business for as long as anyone can remember. "I think you have a smaller subsection of the community that is really offended by this notion of polygamy," says Lorne Eckersley, 54, publisher of the newspaper The Advance, based in the nearby town of Creston. "But I think in the broader community, they are just our neighbors, and the attitude has been, We don't always agree with them, but they are people." The leaders of Bountiful insist that the reason for their arrests is not their wives but their faith. "This is not about polygamy," declared Winston Blackmore in a press statement on Thursday after he and Oler had been conditionally released from jail. 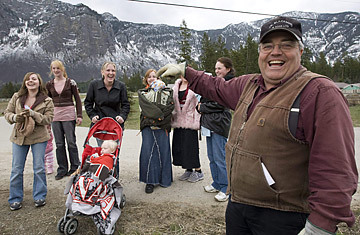 "Tens of thousands of polygamists among many different cultures are hiding in plain sight all across Canada. They are known by their neighbors, policemen, legislators and media just as we are ... But they are not fundamentalist Mormons. To us, this is about religious persecution." But to others, the issue is neither polygamy nor religion but simple sexual abuse. According to Dave Perrin, 60, a local veterinarian and author of the book Keep Sweet, which chronicles the life of former Bountiful "celestial wife" Debbie Palmer, polygamy as it is practiced at Bountiful can encourage and has encouraged unions involving underage girls. Perrin says that in researching Keep Sweet, he unearthed allegations of sexual abuse of minors, which he argues should be the foundation of the government's case against Bountiful's leaders (as it was in the successful prosecution of Jeffs in the U.S. after the prosecutors decided to eschew polygamy charges). "There has been a lot of water under the bridge, and a lot of lives ruined," Perrin told TIME of the government's inability to deal conclusively with Bountiful. According to Eckersley, the prosecution may have opted to press the charge of polygamy because it is the most winnable strategy. Analysts contend that in the absence of plaintiffs or cooperative witnesses, charges of sexual abuse are unlikely to stick. But Eckersley is no more hopeful at the prospect of a successful polygamy prosecution, saying, "There is a strong sense in the legal community this law won't stand up in court." The case is likely to languish in the legal system for years, allowing Bountiful and its way of life to live on. For Bountiful's defenders, this reality is a blessing from an approving God. But for critics who see this way of life as a mill of sexual abuse, it is a tragedy of biblical proportions.